Who didnt watch last night match? Boooooo!! Haha. I love footballs since our Uni time. Friends influence. Hubby on the other hand, like always, layan je semua. We both went to SNBJ to support our team. It was our first time to literally cheer from the stadium. All these while we just supporters in front of tv je. (mintak maaf rumah atas, bawah, kanan dan depan :P). It was 15 minutes ride (of course with our dearly motor) and to arrive there when the match just started, was killing me! The cheer, oh mannnn, gives us shivers and makes us want to run through the building. People starts parking on the road from the toll. Pergh. Penangan Harimau ;) We bought Grand Stand ticket and it takes us almost 15 minutes just to go inside. It was so jammed at the gate! Later we just realize that we went to sit next to SG supporters. Bah! Never mind, we have all Malaysian supporters across the whole stadium. The spirit was all over the stadium. We were screaming and singing for Malaysia. It was devastating to see that SG players shows A LOT of drama. And yes, they win - The best actor on the field. We are so proud with our Malaysian players. They fought as a real player and we are so proud that we lost with dignity. Heading home is another challenge. Another traffic jam. Massive one. We have this conversation about money where I wish how we can grow money over the tree. Everyone can grow a tree but only the one who have really work for it, plant it correctly and of course the right skill of getting the money out it. But being a wise man he said 'Kalau sume pon boleh grow money, sape nk jual food? sape nk cuci sampah? sape nk bukak business?' I debate the word ONLY the one work hard enough can plant the money, means not everyone. It's a long argument discussion. Anyhow, a lot of things screams for 'kaching!' around us. First it was our car but we neglected cause it 'fixable'. 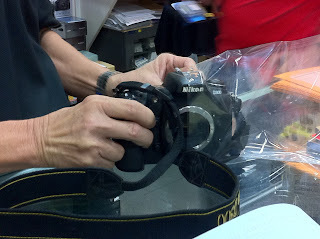 We cut the cost by buying liquid glue, silicon based glue, UHU, gam gajah, and even cellotape. Yeah, we put everything that we know to make sure it can stay there. Haha. Those side mirror has been there since the past two months. It sticks quite hard you know. We already went to Besut and KB, so far still hold strong. Hehe. Slagi tak cabut,tak parah sangat,we keep it like that. Then it comes to this antic bike. First the tyre. Oh yeah, I have to add this story. We went out one night just because we both was damn bored and was so gatal nk jalan Giant that is few km from home. Gatal jalan2 naik moto, xnk naik kete. Half way Hubby wanted to isi angin tayar and we stop by petrol station on our way to Giant. Series of unfortunate events Episode 1 starts when the pump doesnt work (the petrol station close the air from the pump. lain kali letak sign boleh? xde la ktorg try smpai habis angin kluar) and to make it worst, it makes our tyre even more pancit. 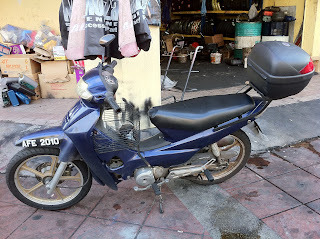 Well as for me, I refuse to ride on it cause it looks worst that the time before we pump it but Hubby on the other hand said 'boleh, boleh' and there you go, Episode 4. We went to buy the tyre pump at Econsave few meters away. Bought it, pump it, still doesnt work. Then realized the tyre da pecah. Flat trus. At last I have to wait there cause he wanted to bring back the bike (faster rather than we both tolak the motor) and pick me up with car.Half hour dating dragged to 2 hours sweat and tired outing. Lolz. Then Hubby's pet. His DSLR. He suddenly died on us when we met Siti Saleha during friends reception. He,as always - the photographer, ready to take picture and clicked. Clicked. Clicked. Look at the camera and I was like 'Hello B, I am with public figure ni. People are waiting for their turn and I dont know what else to talk to her'. Thank god we have iPhones. I hand the phone and ask him to use it instead. With no reason it just can't focus and give black pictures. Duh. Cost us almost thousands. Habis tayar pancit, and camera, next is the side mirror. This is not our fault - entirely. We saw the right side of the side mirror on our basket when we was about to go to the office in the morning. Side mirror can wait. 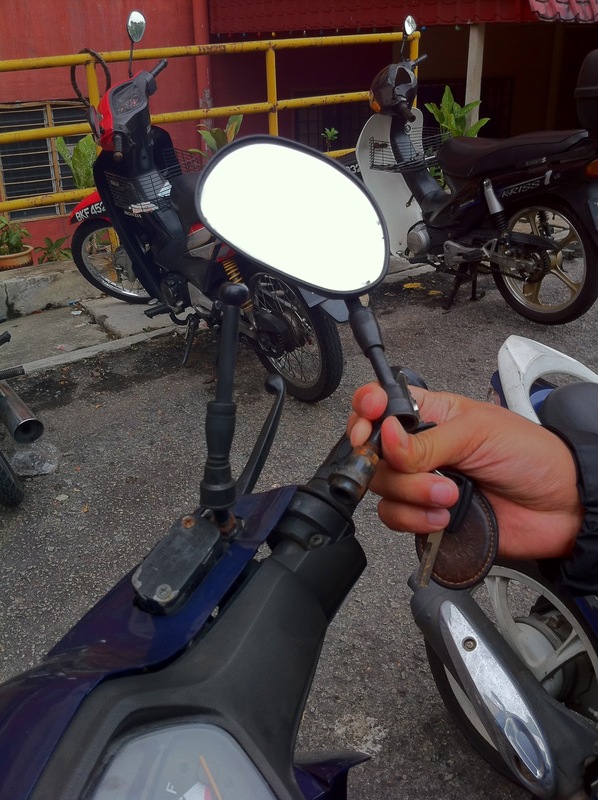 So our bike is cacat with one side mirror. Then is the brake. This one could kill. Straight to workshop and fixed it. Cause hundreds! Bah. Lihat kecacatan itu. Tapi brake da fixed. That picture was taken about three weeks ago and just recently another side mirror is missing. I think there's some kind of side-mirror haters around our home. Hubby suke Rozita Che Wan but everytime her face appears on TV or on billboard, he would ask 'Sape tu?' Setiap kali tau! Tak paham betul. Katanya tak cam tp setiap kali tengok memang cakap cantik. Hubby: Tak baik cakap camtu. Che wan tu natural beauty tau. (back up Che wan) Che Wan je cantik. Artis lain sume huduh. Minggu ni asek rse nk masak je. Kebetulan pagi td breakfast nasik kerabu kat Kg Baru. Dekat sgt dah ngn Chow Kit (CK) so g beli brg basah ikut suke. Selalunyer ktorg g CK bile rse nk masak something je.Tp hari ni pg just because beli stock nk masak je - nothing specific. Pueh memikir nk masak ape. Beli brg basah yang basic lah, ikan kembung, sayur2, pastu tamak beli sotong. Buah xde yg menarik (walaupun ade rambutan RM3 2kg) Seedless oren yg manis tu pun da xmanis mcm last time ktorg beli. Pendek kata takde perasaan la g CK ni. Smpai rumah da kenyang, lipat kain, kemas rumah, ngntuk, tdo, lapar. Haha. So ttbe terfikir ikan percik. Tp xde bekas panggang. Microwave kn ade! Mcm biasa call Umie for confirmation resipi. 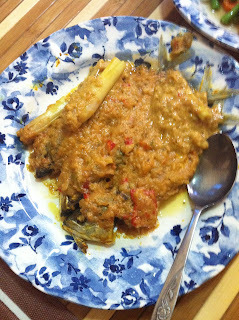 Bawang, cili, santan, halia and serai. Ikan lumur garam kunyit taruk dlm microwave Medium Low for half hour (padah takde pemanggang - lame nk tunggu ikan masak). Pastu baru taruk kuah percik atas ikan. Later that evening Umie call balik. Macam mane percik? Jadi tak? Ehh..mestilah. Kaklong kan pandai masak. Muahahha. Haa..yelah. Kaklong masak ke Hafiz yang masak? Umiiee!!! Mestilahh kaklong!!! Bakpe Hafiz pulak? B, betape besarnyer your cooking effect. Mak mertua sampai ingt B masak semua dah for me. Hahah! Bleh jual kat kedai ni. Sebab kat kedai tu yang tak sedap pun orang beli.